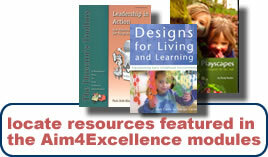 A number of books, videos, and other professional resources are featured within the Aim4Excellence™ modules. Follow the links below to learn more about organizations and resources mentioned in Aim4Excellence™. Exchange Press has promoted the exchange of ideas among leaders in early childhood programs worldwide through its magazine, books, training products, training seminars, and international conferences. Directors can receive daily electronic newsletters from featuring stories, solutions, and trends relevant to the administration of their programs. Community Playthings is a company specializing in furniture and other resources for early childhood settings. The community’s 87-year educational tradition emphasizes unity between home and school, the significance of play, interaction with nature, handcrafts, practical work, imagination and creativity. CMR Learning specializes in "off the shelf" training materials. CRM offers DVDs, online-streaming videos, and other resources for administrators to conduct highly effective and relevant training. Their products are designed to energize and engage staff, enhance leadershippotential, increase communication skills and team effectiveness,keep programs incompliance with government mandates,and save time and moneythrough improved efficiency. The Early Childhood Work Environment Survey is an assessment tool that measures worker perceptions and attitudes about such things as co-worker relations, supervisor support, decision-making influence, goal consensus, and the physical setting. The tool is administered by the McCormick Center for Early Childhood Leadership. Everyday Democracy (formerly the Study Circles Resource Center) is an organization dedicated to help local communicates create and sustain public dialogue and problem solving. They offer on-site workshops and training, online resources, and host a national conference. Gryphon House is a publishing company that specializes in books for early childhood educators. Founded in 1971 by Leah Curry-Rood and Larry Rood, the company recently merged with Kaplan Books expanding its list of available titles. Gryphon House is the publisher of the Innovations series of curriculum books for infant, toddler, and preschool programs. Harvest Resources provides provocative and professional education, resources, and consultation using the pedagogy of a “thinking lens.” The company’s books, videos, CDs, and workshops inspire early childhood educators to engage fully in their own learning. Harvest Resources is a partnership between Margie Carter and Deb Curtis who believe that teachers deserve the time and resources to nourish their hearts and challenge their thinking. When teachers become thoughtful, competent decision makers, they use leadership to transform and advance the profession. National Association of Child Care Resource and Referral Agencies (NACCRRA) works with more than 700 state and local Child Care Resource and Referral agencies nationwide. These agencies help ensure that families have access to high-quality, affordable child care. To achieve their mission, NACCRRA leads projects that increase the quality and availability of child care professionals, undertakes research, and advocates for child care policies that positively impact the lives of children and families. NACCRRA products and resources include Early Childhood Focus, a Web site featuring daily news clippings about child care and child welfare issues, and NACCRRAware, an Internet-based child care referral and reporting software program that manages family, child care program, and community data. National Association for the Education of Young Children (NAEYC) is the world’s largest and most influential organization of early childhood educators dedicated to improving the well-being of young children with a particular focus on the quality of educational and developmental services for all children from birth through age 8. Membership is open to all individuals. NAEYC provides programs that support teachers, administrators, and families including accreditation of programs, standards for professional preparation, and a code of ethical conduct. National and regional conferences, professional journals and books, videos, and other resources in print and online are available. National Head Start Association is a private nonprofit membership organization dedicated exclusively to meeting the needs of Head Start children and their families. The Association provides support for the entire Head Start community by advocating for policies that strengthen services to Head Start children and their families; by providing extensive training and professional development to Head Start staff; and by developing and disseminating research, information, and resources that enrich Head Start program delivery. All NHSA professional development training is designed to support the understanding and implementation of the Head Start Performance Standards, Head Start Core Values, NCATE standards, and important trends in the field of early care and education. New Horizons specializes in low-cost, up-to-date resources to help early childhood administrators effectively and efficiently manage their programs. Whether you are the director of a preschool, the site manager of a Head Start program, an administrator of a family service agency, or a child care home provider, New Horizons’ books and trainer guides will meet your needs. New Horizons publishes the Director’s Toolbox Management Series. Pre-K Now a public education and advocacy campaign that advances high-quality, voluntary pre-kindergarten for all three and four year olds. For administrators of early childhood programs, Pre-K Now provides information on the economic and political landscape surrounding pre-k funding and resources. Pre-K Now is dedicated to educating policymakers about the need for pre-k and raising public awareness about the need for pre-kindergarten for all children. Videatives, Inc. offers a streaming video service, consulting services, and conferences to the early childhood education and child development community: Videatives are text documents presented in electronic format that describe and explain the significance of the goals, strategies, and theories of children engaged in learning experiences. Videative is a composite of the words "video” and "narrative." Teacher College Press (TCP) offers books and materials in all areas of education from infant-toddler to adult learning. Their showcased authors include seasoned practitioners and scholars as well as fresh new talent from around the world. For early childhood administrators, TCP provides resources that look at education, learning, and teaching in diverse ways. TCP publishes the Environment Rating Scales, the Program Administration Scale (PAS), and the Business Administration Scale for Family Child Care (BAS). Workplace Publishing promotes training DVDs and video and training books on subjects especially geared toward administrators. Among the categories of resources offered are leadership, management, coaching, communication skills, team building, and ethics. Zero to Three provides professionals working with very young children and their families an extensive collection of online and print resources aimed at supporting their work in a variety of early childhood settings. Their information is anchored in evidence-based practice and scientific research. Some of Zero to Three’s initiatives include a leadership development program, a center for training services, resources for parents, and a non-partisan policy center helping to bring the voice of babies and toddlers to the public.